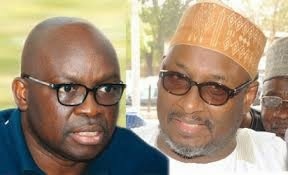 The national chairman of the Peoples Democratic Party, PDP Alhaji Adamu Mu`azu and Governor Ayodele Fayose of Ekiti State Thursday took their brawl to cyberspace with each deriding the other over their different perspectives on the fate of the members of the National Working Committee, NWC of the party. Governor Fayose had recently called for the resignation of Mu`azu as national chairman saying that it was inexcusable that President Goodluck Jonathan could have lost in Mu`azu’s home state of Bauchi with an incumbent PDP governor, minister of Federal Capital Territory and the national chairman. Fayose had pressed on to say that he had evidence that Mu`azu was compromised as national chairman and worked for the All Progressives Congress, APC. Thursday, Mu`azu responded on twitter saying: We hope it’s not the kind of evidence he once said he had that Buhari was dying? Fayose whose twitter account handle had not been in use since April 29 responded within two hours deriding Mu`azu for taking to cyberspace to engage him. He was to follow up with a series of tweets. The tweet was against the background of claims that the presidency and associates of President Goodluck Jonathan were peeved by the refusal of Mu`azu to use strong words against the APC’s presidential candidate, Muhammadu Buhari.